Once children are helped to perceive themselves as authors or inventors, once they are helped to discover the pleasure of enquiry, their motivation and interest explode. – Loris Malaguzzi. 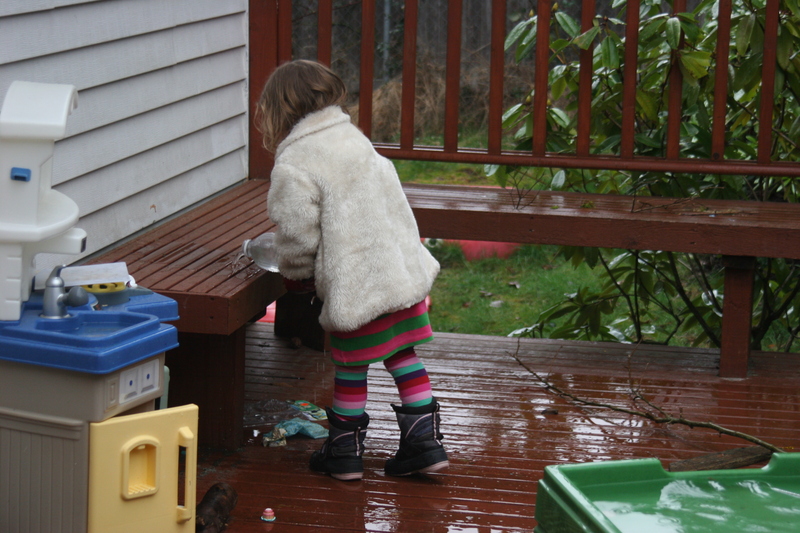 We’ve had a few rainy days so I decided to leave the lid off the water table to catch the rain. We’ve had so much rain that it was nearly overflowing. My girls looked out at the rain and decided to play in the water. 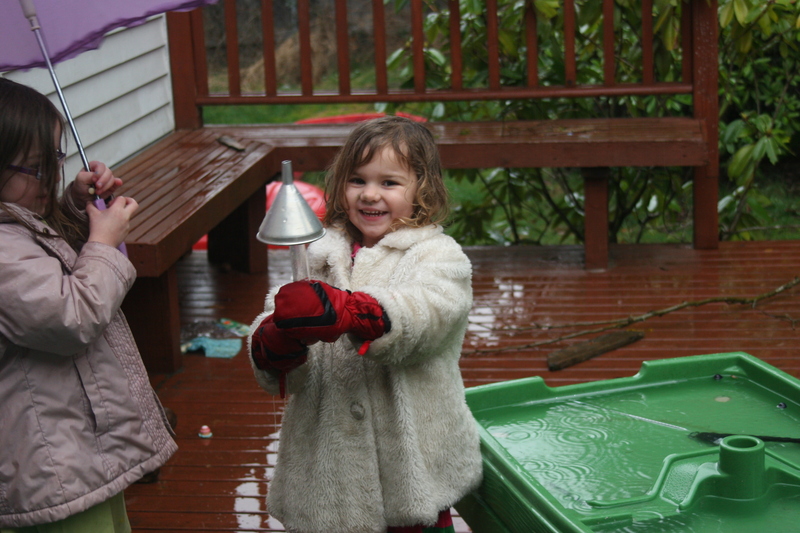 They know from experience that rain water is very cold so my youngest put on her waterproof gloves so that she could tolerate the cold water for longer. I gave her a bottle and a funnel to add to the other materials. I have recently noted her eagerness to transport things from one place to another and predicted she would probably use the bottle to empty the water from the table. True to form she filled the bottle, carried it to the bench and poured the water through the slats before returning for more. Her sister is less eager to play outside but loves umbrellas so when I suggested she take her umbrella outside, she was out like a shot. Of course her sister needed her umbrella too. Like we made before for serving drinks. Last summer the girls had inserted a straw into a hole in a milk carton and made a drink dispenser. They worked out how to turn the tap off and where to place the tap so that they could drain the container of all the water. A cup – this will be good (finding a coffee container) a tube or something and some small cups. I found a piece of plastic tubing and plastic wine glasses. I need another pipe. One to blow into and the other one for the water to come out of. I gave her another piece of tubing that her sister had been using to make a contraption the previous day. It’s not working mummy, when I blow nothing happens. Are there any bubbles coming when you blow. The air isn’t getting through the pipe. We put the container onto the floor so that she could keep the pipe straight without any kinks and still reach to blow into it. I have to be honest I didn’t expect it to work but look what happened. You have to blow so, so hard to make it work that it hurts your mouth, but that’s okay. Meanwhile her sister was trying to catch floating objects with the tongs. I don’t know what we would do without our garden. Makes me realise how lucky we are. Thanks for visiting. 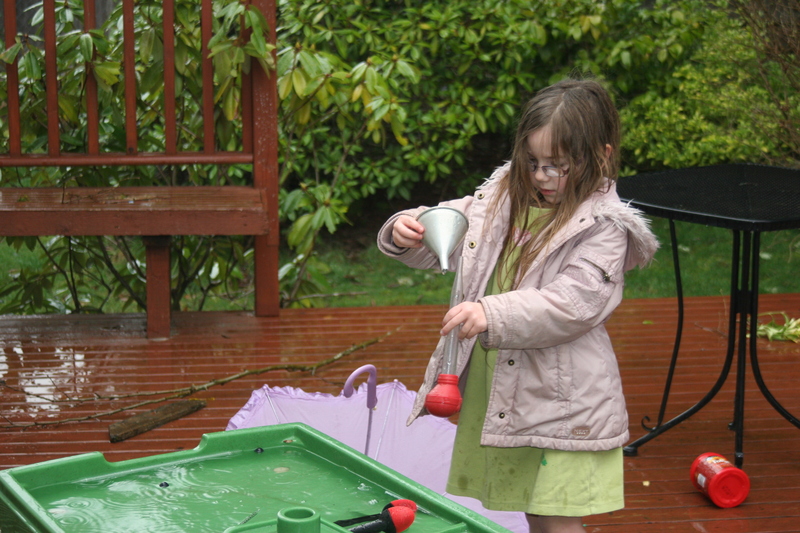 Perfect play in the rain, being in the garden it’s only a step away to dry off and warm up after having such fun creative play. Thanks for linking up and sharing your great ideas with Country Kids. This is a fabulous idea! It’s a way to learn and have fun in the rain! Love it! I’m definitely pinning this one. Thank you so much for linking up with us at the #homeschoollinkup! Such great inventors your girls are! Thanks for linking up to the Outdoor Play Party. Cheers.